PGCC의 설립자인 Tim Somervile은 대략 20여년 전에 세계 골프의 리더를 교육할 골프 스쿨을 위해 이상적인 곳을 찾아 미국 전역을 탐색하였고, 곧 완벽한 곳을 발견하게 되었습니다. LA 동부와 오렌지 카운티, 그리고 샌디에고 북쪽에 인접해서 연중 따뜻하고 거의 완벽한 골프조건을 가지고 있는 테메큘라를 발견했기 때문입니다. 가장 좋았던 점은 테메큘라가 캘리포니아 지역에서 가장 좋게 평가되고 있는 200개 이상의 골프 시설로부터 대략 90마일 정도 밖에 떨어져 있지 않기 때문이었습니다. 아름다운 골짜기에 위치한 테메큘라에서는 비가 거의 오지 않고, 비나 눈이 거의 오지 않는 전형적인 서부 캘리포니아의 날씨를 즐길 수 있습니다. 평화롭지만 경제적으로 번영한 테메큘라 지역은 챔피언십 코스의 중심이 되면서 언제나 골프를 치러 갈 수 있는 조건을 가지고 있습니다. 또한 지역의 골프 팬들은 훌륭한 선수들의 경기를 근거리에서 관전할 수 있는 충분한 기회를 가지고 있습니다. 매년 PGA 투어의 ‘West Coast Swing’은 인접한 네 개 지역에 토너먼트를 개최하고 있습니다. LPGA의 매 시즌 첫 번째 메이저 대회인 크레프트 나비스코 챔피언십을 비롯한 LPGA 투어와 시니어 PGA 또한 매년 PGCC 근처에서 경기를 열고 있습니다. 그러므로 이 지역에서 세계의 가장 열정적이고 성공한 골퍼들이 매년 배출되는 것은 너무나 당연한 일인지도 모릅니다. 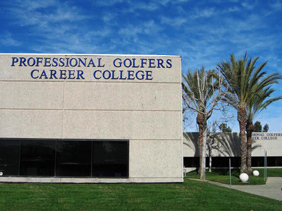 PGCC (Professional Golfers Career College)는 전세계에서 주 5 일 골프 과정을 연방 정부에서 교육 인가를 받은 유일한 교육 기관입니다. 그러므로, 모든 골프 부대 비용은 학비에 포함되게 됩니다. 테메큘라와 리버사이드 카운티에서의 골프 이론과 골프 실기는 세계 최고 수준입니다. PGCC는 학생들을 위해 모든 행정적 뒷바침을 하고 있습니다. 만약 학생이 티 타임을 예약하기 전에 티쉿이 마감되었다면, PGCC의 행정 직원이 다른 모든 일을 멈추고 학생을 위한 골프장을 함께 찾아 줄 것입니다. 그렇지 않으면 그 학생은 그날 골프를칠 수 없기 때문입니다. PGCC는 새로운 학생을 위한 마케팅을 하는 것 보다 현재 PGCC에 다니고 있는 학생을 위한 골프 지원을 가장 중요한 정신으로 받아 들이고 있습니다. 캘리포니아 테메큘라의 PGCC에 다니는 학생들은 학교에 다니는 동안 아래 골프 코스에서 골프를 칠 수 있게 됩니다. PGCC’s Home Course! This well manicured course is a classic Ted Robinson design, featuring five lakes and numerous doglegs to challenge golfers of all abilities. Locally known for its excellent greens, the course plays tougher than its 6,600 yards would indicate. This 7,175 yard championship course is one of the toughest tests of golf in California. From the back tees, the course plays to a rating of 75.1 with a slope of 145. Home of many professional tournaments and qualifiers, this course is always in exceptional shape. Bring your ‘A’ game—even scratch players have been known to shoot rounds in the 80s here. Home of “pristine golf,” Cross Creek is beautifully crafted by Arthur Hills, one of America’s most celebrated modern day architects. The terrain was carved and prepared as if nature intended for the golf course to be built on this site. Many tees and greens are secluded in groves of age-old Oak and Sycamore trees. The course isn’t overly long (6,833 par 71), but it is definitely a challenge, even for scratch golfers (74.1/142). Also boasting an excellent practice facility, Cross Creek is truly one of California’s finest. Rated “four stars” and ranked one of the top 200 golf courses in the U.S. by Golf Digest, Pala Mesa is just south of the college across the San Diego county border. The course is a challenging, beautifully manicured 18-hole par 72 layout accented by majestic oaks, sycamores, and other mature trees. Relatively short (6,502/72.0/132), Pala Mesa definitely puts a premium on accuracy. When you finally reach the greens, that’s where the real fun begins since Pala Mesa is well known for its fast, tricky greens. Hemet Golf Club is an 18-hole, par 71, Schmidt-Curley design featuring Bent Grass greens and cool season grass fairways. Seven holes on the golf course meander through the picturesque edges of colorful foothills, revealing the natural beauty of the terrain and spectacular snow-capped peaks of the San Jacinto Mountains. A newer course that’s always in excellent shape, Landmark at Hemet is quickly becoming a favorite of Southern California golfers. Diamond Valley Golf Club is a challenging par-72 layout (6,720/73.0/135). One of the few courses in the area with Bermuda grass greens, Diamond Valley gives our students a great opportunity to test their putting skills on a different type of green, since most greens in Southern California are either poa annua, or bent grass. Always in great shape, Diamond Valley is a definite “must play” in the area. Temecula Creek Inn features 27-Holes of Championship Golf surrounded by over 300 acres of rustic beauty, dramatic elevation changes, sweeping mountain views and year-round sunny weather. Temecula Creek Inn Golf Course was awarded a Four-Star rating from Golf Digest’s “Places to Play,” and provides Golfers with a perfect combination of challenging Golf and breathtaking scenery. Stonehouse Nine Golf Course features rock outcroppings where precision play is critical. Featuring 36 holes of golf in a beautiful setting, Menifee Lakes is aptly named, since water comes into play on 17 of the 36 holes on the course. With firm, fast fairways and greens that usually run true, Menifee Lakes is a great course for low handicappers to “go low.” In fact, at the recent U.S. Amateur Public Links qualifier, local college golfer Brendan Steele shot a two round total of 17-under 127. Glen Ivy Golf Club is a unique golf experience, with scenic views and creativley placed fairways, tees and greens. This par 72 course, designed by renowned golf course architect Ted Robinson Sr., is as pleasing to the eye as it is challenging. Woven through the groves of citrus trees and the hillsides and canyons along the Cleveland National Forest. Vista Valley is set in a beautiful valley and offers a peaceful escape from all the noise and bustle of the city. The beautiful Ted Robinson Designed 18-hole championship golf course presents a fresh challenge and a new opportunity from tee to green which allows players of all levels to enjoy the sport in its purest form and is everything the discerning golfer should, and would expect, from an exceptional private country club. Twin Oaks Golf Course in San Marcos, California, Ted Robinson, course architect, has created a golf course that finds balance. Fairways at Twin Oaks can be narrow and test golfers’ accuracy off the tee. Keep your drives out of the rough, and you’ll be rewarded with ample opportunities to hit the green in regulation. You’ll also find the greens to be quick and true: Read your putt correctly and your ball will find the hole. Nestled between Southern California’s largest natural lake, Lake Elsinore, the Ortega Mountains and the Cleveland Natural Forest, and just minutes from Temecula, the Links at Summerly’s stunning par-72, nearly 7,000-yard layout was designed by renowned golf course architect Cal Olson to fit seamlessly into the landscape – incorporating natural mounding, pristine rolling terrain and three miles of Scottish-style burns to provide the look and feel of traditional links-style courses of the British Isles.